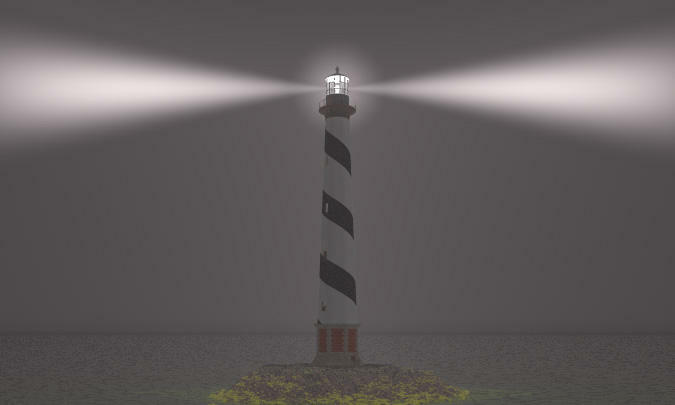 Very new to Bryce, but i would like to put a light in a lighthouse. I have managed to add a light but can't get it to spread out like a lighthouse would. I haven't done Bryce in a long time but I think you want a volume with cloud noise and some ambiance assigned. In the Light Lab, set the spot light to Visible Object. Try either surface (renders faster) or Volume. sort of like tthis ? I used a radial and a spot. Or maybe fake it with a cone and a texure, like the old Br5 "lit rays", only this time I need to play and get the fall off on the texture going in reverse. Thank you Gedd, Horo and Chohole for your advice. More like this one: http://www.bryce5.com/details.php?image_id=563 it should fade into the distance. If you go rather for a look shown in chohole's picture, get the free Streaming Rays from here: http://www.bryce5.com/details.php?image_id=1144 curtesy by Denny Markovic aka Frozencry. OK I know I'm a bit late to this party, but I wanted to see if I could find an alternative way to the ones suggested. I tried no end of volume light and materials (but they stop working when HDRI are loaded) - so that was no good... and well, cut a long story short, this is what I came up with. It's not exactly suited to beginners, but it might be of passing interest to some of the other posters. I wish I'd have had that tutorial last year when I did this one. Trust me Dave, if it was simple, I wouldn't have nearly bitten my mouse mat in half in sheer frustration. First Bryce can crash, then Camtasia can crash, then the video rendering can produce a file that crashes and then the whole maddening cycle begins over again. And failing all else, youtube can just decide to sit with the video at 95% uploaded for hours at a time - apparently not doing anything very much. Anyway, I hope you can follow the tutorial OK and it helps you in the future - even if it can't help you in the past. I am going to have to find time to go through that Tutorial, super end result there David. I guess it is not going to work in my normally used version of Bryce though. Lost me at the beginning! Will have to play with lights a bit more. There are ways and means, if you send me a stripped down source file with the lighting setup you imagine using I could probably figure something out as a compromise. But really, all things considered, Bryce 7.1 Pro... Can't you sell a kidney or something, or better still, someone else's? Yeah sorry Wendy, it was more of an alternative solution than an easy practical one. But since all the easy options had gone, I wanted to offer up something else. David I will get that new PC so** ...umm I mean somtime in the not too distant future. Just need the time to actually get round to reviewing the way I designed it to see if I still feel the same. order it, finish making sure I have everything backed up onto externals, know where all my app cds are, you know those strange things that program used to come on, as a lot of my software is older versions. Then I need to make sure I will have the time to set the new machine up without too much distraction. When that all come together then I shall hit the button to send my order winging it;s way over to PCSpecialist.co.uk, which is the company that built this machine for me over 6 years ago, As they are still in business I take that to mean that they are still as good as they were. Excellent tutorial David, really enjoyed going through it. Have to give that a try. What might be simpler (but not nearly as effective) is to surround the object with a large cube and apply a very basic volumetric texture. This quickie image had a large cube (ME screen cap shown), 2 spotlights opposing each other and a radial light at the center of them. Added a bit of IBL to illuminate the objects. Render time just under 20 minutes. Thanks Dan, well that works a treat and is easier to do. The render time is not too punishing either even with the quality set so high. So, here's a thing, during my experiments I returned again to Volumetric World, something I keep having a tinker with, but with very little success. Have you any tips to offer? So, here's a thing, during my experiments I returned again to Volumetric World, something I keep having a tinker with, but with very little success. Have you any tips to offer? Seems that we're thinking about the same. I started experimenting with this render hog system a few days ago. Tips from anyone are most welcome. Sorry this took a while but probably the best tip is don't bother, it's just too slow. V-cubes are much faster render and much more flexible. When V-worlds came out (B4) there was never much info about it (even in RWB4) except that it was a Bryce world sized cube, Basic Shaded, Receive Shadows only and Sky Integration/Uniform density. The problem is that ray hits can extend all the way to the edge of the Bryce world which is very time consuming and of little render value. But when the new Bryce illumination stuff came out, V-worlds would crash as soon as a render was started. This was fixed in Bryce 7 but the fix seems to add additional problems. The density control only seems to go up to a V density of something around 5 or 6 instead of the 100 density of the old version and the height has been lowered. 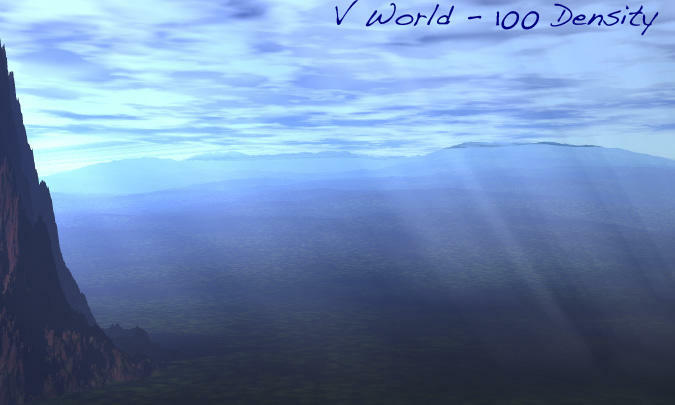 The first image shows a V-world density of 100 but it's not very dense. You can also see the background mountains are "above" the V-world. 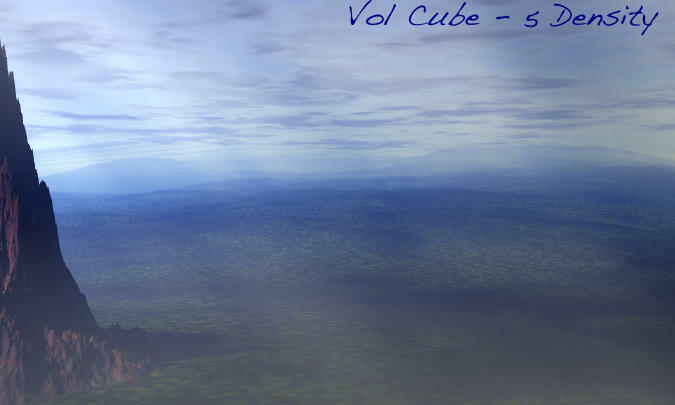 The second image shows a large V-cub with a density of 5 which is a pretty close but the back mountains are "below" the top of the V-cube. But this rendered in about 50 minutes while the V-world around 4 hours. The last image is the only of several V-worlds I messed with that I kinda liked. 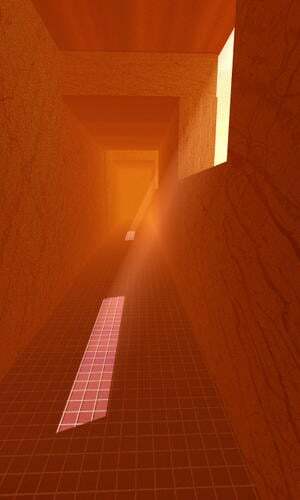 Just a cube hallway with some holes and a lot of Haze for the V-world Sky Integration to relate to. Also added TA (which doesn't affect Volumetrics much bit does effect the Haze). This rendered, for some reason, at about the same time as a V-cube - 48 minutes. This was all done on the Mac version so PC results may very. Thanks for the examples, Dan. The hallway images looks nice. Neither the handbook that came with Bryce 5 nor Susan Kitchens Bryce 4 book elaborate on Virtual World. Experiments show that there are also flaws but it may be premature to draw conclusions. I keep on experimenting but have assigned it a lower priority. Thanks again Dan for your invaluable insights, a pleasure as always to hear from you. The hallway looks particularly good I have to say. I'm a bit on the simple-minded side of things. I am trying to reproduce this volume effect but I am having a tad bit of trouble. 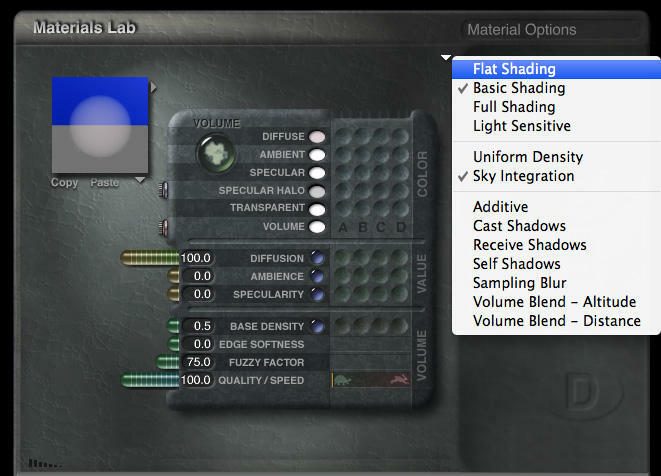 Could someone please score out the exact material lab settings for this effect please. I am getting weird results from my own attempts. Thanks to anyone who has figured this out. Rashad - I f you're getting artifacts it's probably that the Quality is set too low. @Rashad - I sent you an email. Perhaps it helps, perhaps not.